Quite often, actually using my desk can be quite a challenge. Because it’s quite small and I have so much crap lying around and no where to store it, I usually only have a small space for things like notepads, pens and post-its. 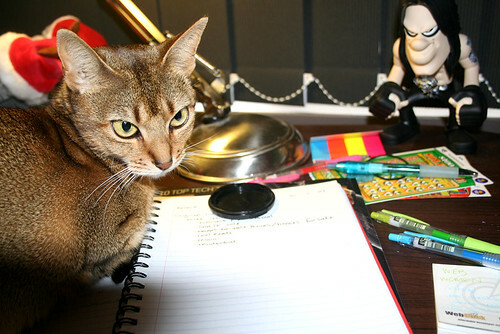 But then sometimes it gets pointed out to me by those who must be obeyed that it’s not actually my desk at all. This morning, for example, Honey parked herself there and proceeded to try and stare out Danzig. I don’t think she realises that he’s plastic, and subsequently can’t blink. She had a good go at it however. So, there we have it: Photo Project Day 11. Are you impressed that I made it through 10 whole days without reducing myself to cat-blogging? I am. According to The Tunafish With No Blog’s initial projection, I will lose enthusiasm in said Photo Project sometime in the next 3 days or so. ~ by goatlady on January 11, 2007.